Top of the line OUST -- Simply put -- THESE THINGS ROCK! When every second counts -- this is what you should count on. Recommended for serious slalom racing setups and 360 steel wheel spinning setups. Invest in the best! EXTRA VALUE: Don't forget to protect your new set of Oust Moc 9's with Oust Speed Lube. Add on above and protect your investment. Speed and cleanliness have always been two major issues in the Manufacturing process. The Moc 9 ... addresses both issues. 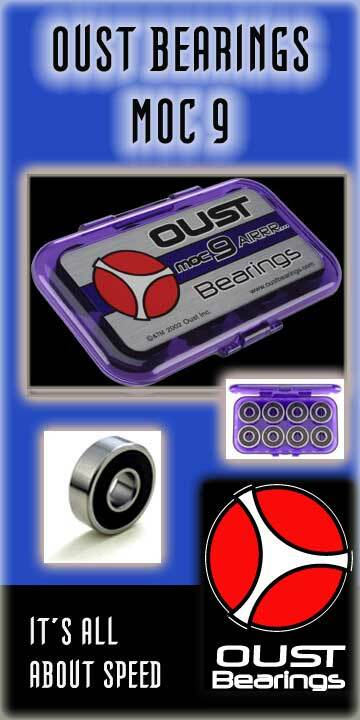 Manufactured with the highest quality USA made balls, finer polished raceways and a seal system that is different from all other methods of bearing seals in the bearing industry at the present time.